​​​​​​ DALLAS – Legacy Senior Communities broke ground on its new $175 million retirement community, named The Legacy Midtown Park, in June 2018. The eight-story development, located at 8182 Manderville Ln., will include 184 independent-living apartments, 50 assisted-living apartments, 36 memory-care residences, and 54 short-term rehabilitation or long-term care suites. The community is being built on ten acres in the 80-acre Midtown Park district located between North Central and Greenville Ave. on Meadow Rd. Phase one is set to begin ​July 2018 with delivery anticipated for fall 2019. Legacy Senior Communities has operated since 1953 and is a non-profit charitable organization that serves seniors. 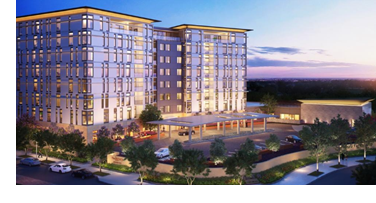 ​​See also: New $175M senior community breaks ground in Dallas​.